7.9 " IPS TFT , LED backlight and Multi-Touch. Apple has reimagined the king of tablets to deliver up to four times the performance in CPU and eight times the performance in graphics. The iPad Mini Retina’s highly-efficient A7 chip uses 64-bit architecture that doesn’t eat up battery life so you can surf Wi-Fi, enjoy videos, or listen to music for up to 10 hours. 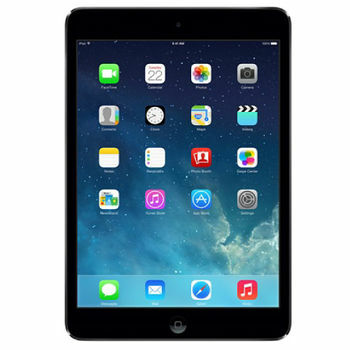 The Apple iPad Mini Retina WiFi 16GB features a 7.9”stunning Retina display that has a million more than an HDTV (326 PPI), so you get nothing but crisp and crystal clear images with IPS technology. The Apple iPad Mini Retina also comes preloaded with some of the most loved apps for iOS 7, with millions more available for download on the App Store. And with two MIMO equipped antennas instead of one, you’ll get twice the Wi‑Fi performance compared to previous models for a browsing experience that is faster than ever. Small but mighty. At 331 gramsApple has reimagined the king of tablets to deliver up to four times the performance in CPU and eight times the performance in graphics. The iPad Mini Retina’s highly-efficient A7 chip uses 64-bit architecture that doesn’t eat up battery life so you can surf Wi-Fi, enjoy videos, or listen to music for up to 10 hours. The Apple iPad Mini Retina WiFi 16GB features a 7.9”stunning Retina display that has a million more than an HDTV (326 PPI), so you get nothing but crisp and crystal clear images with IPS technology. The Apple iPad Mini Retina also comes preloaded with some of the most loved apps for iOS 7, with millions more available for download on the App Store. And with two MIMO equipped antennas instead of one, you’ll get twice the Wi‑Fi performance compared to previous models for a browsing experience that is faster than ever. Display Type 7.9" IPS TFT , LED backlight and Multi-Touch.